The following fees and deposits are charged by the property at time of service, check-in, or check-out. Fee for buffet breakfast: THB 530 for adults and THB 265 for children (approximately) The above list may not be comprehensive. Fees and deposits may not include tax and are subject to change. This property offers transfers from the train station. Guests must contact the property with arrival details 24 hours prior to arrival, using the contact information on the booking confirmation. Only registered guests are allowed in the guestrooms. The property has connecting/adjoining rooms, which are subject to availability and can be requested by contacting the property using the number on the booking confirmation. We understand that sometimes your travel plans change. We do not charge a change or cancel fee. 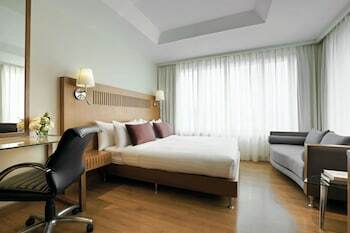 However, this property (Avani Atrium Bangkok Hotel) imposes the following penalty to its customers that we are required to pass on: Cancellations or changes made after 6:00 PM ((GMT+07:00)) on Apr 22, 2019 are subject to a 1 Night Room & Tax penalty. If you fail to check-in for this reservation, or if you cancel or change this reservation after check-in, you may incur penalty charges at the discretion of the property of up to 100% of the booking value.